“Woman is born free and lives equal to man in her rights,” declared Olympe de Gouges in 1791. Unfortunately, the French Revolutionary government didn’t agree with Olympe, and never granted women full equal and political rights as those enjoyed by men, believing their place was at home, raising their children to love their country and the republic. But this didn’t stop many women from participating in every aspect of the French Revolution. Author Lucy Moore takes a look at the lives of six of these women during this turbulent time in French history. These six women couldn’t be more different from one another. They all came from different backgrounds and had their own ideas and hopes about the revolution. Germaine De Stael was an intelligent writer at the heart of Paris’ intellectual movement; Theroigne de Mericourt, a courtesan who had been abused by men all her life and now dreamed that the Revolution would finally free women from their subservient position in society, only to die in an asylum; Theresia Tallien, a passionate and decadent noblewoman imprisoned during the Terror, who boasted that her lover had brought on Robespierre’s fall to save her life; Pauline Leon, a working class, radical activist and a feminist; Madame Roland, a bourgeois woman, was an ardent republican and an influential member of the Girondist faction; and Juliette Recamier, a charming and beautiful lady who was very popular during the Directory period. All of them do have something in common though: they had believed in the Revolution only to see all their hopes crashed. 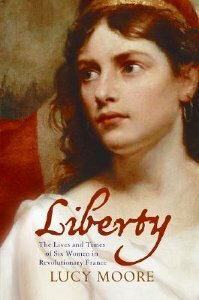 However, Liberty is much more than just a biography of these six women. The book tells the history of the revolution, and all its events, seen through women’s eyes, giving us a different perspective, one often ignored by most historians, on this period. It is well-researched and well-written. The writing style is engaging and accessible, although sometimes the author tends to jump backwards and forwards in time and place, which can confuse readers, especially if they don’t already have a basic knowledge of this period. Overall, Liberty a must-read for anyone interested in the French revolution. Liberty: The Lives Of Six Women in Revolutionary France tells the history of the French revolution through the eyes of six women, all from different social classes, backgrounds, dreams and ideals, who witnessed and participated in it. The book is well-written and well-researched, but, because it doesn’t always follow chronological order, it can be a bit confusing for readers who aren’t already familiar with this time period.